Airman Darren Becker is a US Air Force Tau'ri who was assigned to the officer's mess hall on the Icarus base in 2009. He was part of the 80's people who evacuated to the Stargate and became stranded inside the Ancient spaceship Destiny. Darren Becker was part of the US Air Force as a cook. In 2009, he was assigned in the officer's mess kitchen on the Icarus base located on P4X-351 (SGU: "Air", Part 1). Along with some collegues, Becker prepared a dinner after Senator Alan Armstrong, Chloe (his daughter) and Eli Wallace's arrival on Icarus base. He also prepared a lunch box for Doctor Nicholas Rush, and attemps to give it to him with no success. When enemy forces launch an attack on the base, Becker, along with some 80 people evacuate the base by the Stargate. They are all stranded inside an Ancient spaceship, located several billion lightyears away from Earth. Inside Destiny, Lieutenant Matthew Scott is giving directives when the crew is ready to do some recon in the ship. When Scott mentions things which could be dangerous, Becker asks how can they determine what is dangerous, Scott replies not to touch anything, just look. Becker is making rations for the crew with a strict respect of product and water doses. He gives a portion to Colonel Everett Young. When Docteur Nicholas Rush comes into the mess hall, Becker gives him a ration too and Rush thanks him. When Rush leaves the mess hall, he gives back the plate replying "It's delicious". Becker keeps giving rations to a new group who's coming into the mess hall. When everybody leave the room, with the exception of Young, Camile Wray and Becker, Becker asks Young about his assignment. Young replies: "Recepies, Becker. For the love of God, recepies." Destiny seems to head up to a star and to leave no chance for the crew to survive. In the embarkation room, Colonel Young is making a lottery to choose fifteen people who will board the only viable Ancient shuttle and reach the only seemingly viable planete. Becker is the first selected to hiw own surprise. Young orders him to go to the shuttle where are waiting Lieutenants Scott and Tamara Johansen. Scott invites him to take a seat and to strap in. The shuttle, with Becker inside, lands back on Destiny, indeed, the spaceship headed back into the sun to fill back her batteries. 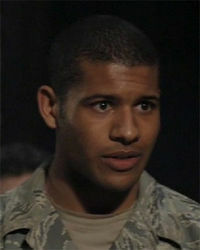 In all SGU's ending credits, Jeffrey Bowyer-Chapman is credited as "Pvt (for Private) Darren Becker". This lowest military rank is for US Army, the land-based military. Yet Becker is wearing US Air Force fatigues with his name on the chest and with the Airman rank on his fatigues' sleeves (SGU: "Air", Part 2). He should be credited as "Airman Darren Becker", not "Private". This is obvioulsy a goof. Darren Becker, an alternate version from an alternate timeline (SGU: "Twin Destinies"). Private Darren Becker on the official Stargate MGM website. This page was last edited on 5 August 2013, at 11:07.